It is amazing to me the amount of people being hurt in the name of fitness. There is a huge epidemic of orthopedic injuries in people who have started exercising with poor movement skills and posture. When you lack basic mobility and stability, which just about everyone does your fitness training is essentially being planted in dead soil and you get hurt. Marketing and not science has developed this ideology that you might have seen on infomercials like P90x that our muscles somehow need to be confused in order to make any progress. First of all “Muscle Confusion” is not even a scientifically valid term and behind all their fancy charts and histograms is a program that pushes ridiculous exercise patterns, incorrect Plyometric techniques, an excessively long time dedicated to abdominal crunches and ridiculous emphasis on "step-aerobic" type cardio that goes on for an undesirably long time . These programs will insist that what doesn’t kill us will make us stronger. The reality is what doesn’t kill us just hasn’t really killed us yet. We need to stop hurting people in the name of getting fit. But that’s what happens when these programs pick ridiculous exercises and have you perform them with horrible form. Eventually you go from trainee to an injured patient. There are rules all fitness professionals have to follow but few hardly do including the creator of these programs. This concept is as basic as the joint by joint principle. We have a series of stable segments throughout your body trying to maintain position on moving mobile joints. An easier way to explain is that you can’t ask a joint to move that has no business moving. Let’s use the example of a sit- up, you are asking a stable part of your spine (lumbar) to move. By doing this you will develop disc problems, tight hip flexors, loss of glute function, poor posture and you will develop poor core sequencing. What are even worse than crunches are crunches with rotation because you have even less rotation (13 degrees) than you do of flexion. Also the majority of the population has really bad posture in a seated position. Why then would you put yourself into bad posture an additional 250 times a day like they have you do in these workouts! These are not opinions but facts and I don’t want people hurting other people. Let’s look at the knee which is a stable joint these programs have an hour devoted to plyometric (jumping) workouts. First off the best plyometric should be where you jump and land in the same position. Not jumping up on a box where you look like a frogman. 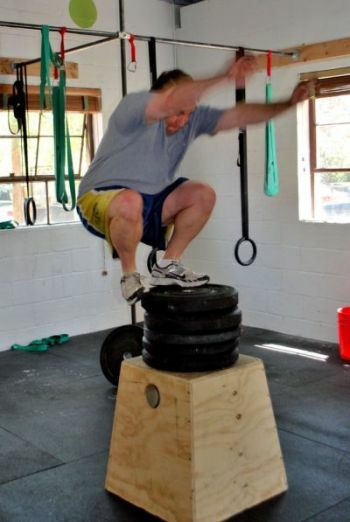 Depth box jumps (what you see being used in most facilities) are horrible because the box height is set way too high; as a result, ground contact times are lengthened. Research shows ideal height should be around 30cm (Bompa et.al, 2005). The true idea of plyometrics is to take advantage of the stretch- shortening cycle mechanism meaning you want quick feet (research shows less than <0.25 seconds of ground contact indicates a fast stretch-shortening cycle (SSC) (Schmidtbleicher 1992)[2) not the lengthened ground contact time you get with box jumps. Another major mistake is turning plyometrics into a conditioning exercise because you need at least three times the recovery of the time spent executing your plyometric work. Lastly, way too many people who are doing these jumping workouts are overweight to begin with and the bigger someone is the poorer their strength to body weight ratio is which equals an injury. Now let’s discuss this muscle confusion approach. These programs will constantly introduce the trainee to a new workout every day to keep your interest but they are not applied in a repetitive enough manner for the body to adapt and make change. You are essentially exercising with no purpose. Let’s say your goal is to get in the best shape of your life, in order to do that your body needs to improve its motor unit recruitment patterns (how you get fit). So instead of introducing yourself to a new exercise everyday would it not be better to master the initial movement and allow your nervous system to improve the recruitment pattern, in turn releasing inhibition. This will allow your system to apply greater force due to your muscles and joint structural components (tendons, ligaments, etc) making structural changes that can support more weight and decrease your risk of injuries. Getting in great shape is our ultimate goal correct? So why constantly change your exercise routine? I fully understand that people get bored with their fitness program but what these training programs fail to let you know is that there is a remedy to keep your interest and yourself from hitting a plateau, it is called periodization. Periodization is scientifically tried and true and has been around forever. Periodization involves manipulation of volume, intensity, duration and rest periods in different cycle phases which would keep you from hitting a plateau and keep your body functioning at a high level all the time. At Heart Fit we use concurrent periodization for all of our strength training programs. This broad approach affords us the flexibility we need to make specific changes for each client based on the adaptations we observe, not something we assume has taken place. The public has a long standing belief that difficult and complicated is somehow better for the body “no pain no gain” and in fact we actually reward monetary compensation to those who intentionally push these false claims. Remember physical challenges may in fact make us tougher but intelligently designed physical challenges make us stronger. And the goal of life is to enjoy it rather than simply surviving it!